1838 CONSTITUTION, or FORM OF GOVERNMENT, for the PEOPLE OF FLORIDA. Biographical / Historical: With the possibility of being admitted to statehood, an Act was passed by the Territorial Council in 1838, approved by Governor Richard Keith Call, calling for the election of delegates in October of 1838, to a convention to be held at St. Joseph, West Florida. The delegates were to draft a constitution and bill of rights for the Territory of Florida. Description: The series consists of a handwritten copy of the 1838 Constitution or "Form of Government for the People of Florida," signed by Convention President, Robert Raymond Reid, and Convention Secretary, Joshua Knowles. The original Constitution, signed by all the delegates, has never been found. Considered "a secretary's copy," this document is the only known copy of the 1838 Constitution. Ownership / Custodial History: Donor is a descendant of a participant in the Florida Constitutional Convention at St. Joseph. The Constitution was found in her home. Section 1. That all freemen, when they form a social compact, are equal; and have certain inherent and indefeasible rights, among which are those of enjoying and defending life and liberty; of acquiring, possessing, and protecting property and reputation; and of pursuing their own happiness. Section 2. That all political power is inherent in the people, and all free governments are founded on their authority, and established for their benefit; and, therefore, they have, at all times, an inalienable and indefeasible right to alter or abolish their form of government, in such manner as they may deem expedient. Section 3. That all men have a natural and inalienable right to worship Almighty God according to the dictates of their own conscience; and that no preference shall ever be given by law to any religious establishment, or mode of worship in this State. Section 4. That all elections shall be free and equal; and that no property qualification for eligibility to office, or for the right of suffrage, shall ever be required in this State. Section 5. That every citizen may freely speak, write, and publish his sentiments on all subjects, being responsible for the abuse of that liberty; and no law shall ever be passed to curtail, abridge, or restrain the liberty of speech or of the press. Section 6. That the right of trial by jury shall forever remain inviolate. Section 7. That the people shall be secure in their persons, houses, papers, and possessions from unreasonable seizures and searches; and that no warrant to search any place, or to seize any person or thing, shall issue without describing the place to be searched, and the person or thing to be seized, as nearly as may be, nor without probable cause, supported by oath or affirmation. Section 8. That no freeman shall be taken, imprisoned, or disseized of his freehold, liberties, or outlawed or exiled, or in any manner destroyed or deprived of his life, liberty, or property, but by the law of the land. Section 9. That all Courts shall be open, and every person, for an injury done him, in his lands, goods, person, or reputation, shall have remedy by due course of law; and right and justice administered without sale, denial, or delay. Section 10. That in all criminal prosecutions, the accused hath a right to be heard by himself or counsel, or both; to demand the nature and cause of the accusation; to be confronted with the witnesses against him; to have compulsory process for obtaining witnesses in his favor; and in all prosecutions by indictment or presentment a speedy and public trial, by an impartial jury of the County or District, where the offense was committed; and shall not be compelled to give evidence against himself. Section 11. That all persons shall be bailable, by sufficient securities, unless in capital offenses, where the proof is evident, or the presumption is strong; and the privilege of habeas corpus shall not be suspended, unless when, in case of rebellion or invasion, the public safety may require it. Section 12. That excessive bail shall in no case be required; nor shall excessive fines be imposed; nor shall cruel or unusual punishments be inflicted. Section 13. That no person shall, for the same offense, be twice put in jeopardy of life or limb. Section 14. That private property shall not be taken or applied to public use, unless just compensation be made therefor. Section 15. That in all prosecutions and indictments for libel, the truth may be given in evidence; and if it shall appear to the jury that the libel is true, and published with good motives and for justifiable ends, the truth shall be a justification; and the jury shall be the judges of the law and facts. Section 16. That no person shall be put to answer any criminal charge, but by presentment, indictment or impeachment. Section 17. That no conviction shall work corruption of blood, or forfeiture of estate. Section 18. That retrospective laws, punishing acts committed before the existence of such laws, and by them only declared penal, or criminal, are oppressive, unjust, and incompatible with liberty; wherefore, no ex post facto law shall ever be made. Section 19. That no law impairing the obligation of contracts shall ever be passed. Section 20. That the people have a right, in a peaceable manner, to assemble together to consult for the common good; and to apply to those invested with the powers of government, for redress of grievances, or other proper purposes, by petition, address, or remonstrance. Section 21. That the free white men of this State shall have the right to keep and to bear arms, for their common defense. Section 22. That no soldier in time of peace, shall be quartered in any house without the consent of the owner; nor in time of war but in a manner prescribed by law. Section 23. That no standing army shall be kept up without the consent of the Legislature: and the military shall in all cases and at all times, be in strict subordination to the civil power. Section 24. That perpetuities and monopolies are contrary to the genius of a free State, and ought not to be allowed. Section 25. That no hereditary emoluments, privileges, or honors, shall ever be granted or conferred in this State. Section 26. That frequent recurrence to fundamental principles, is absolutely necessary to preserve the blessings of liberty. Section 27. That to guard against transgressions upon the rights of the people, we declare that every thing in this article is excepted out of the general powers of government, and shall forever remain inviolate; and that all laws contrary thereto, or to the following provisions, shall be void. ARTICLE II. Distribution of the Powers of Government. Section 1. The powers of the Government of the State of Florida, shall be divided into three distinct departments, and each of them confided to a separate body of Magistracy, to wit: Those which are Legislative to one; those which are Executive to another; and those which are Judicial to another. Section 2. No person, or collection of persons, being one of those departments, shall exercise any power properly belonging to either of the others, except in the instances expressly provided in this Constitution. Section 1. The Supreme Executive Power shall be vested in a Chief Magistrate, who shall be styled the Governor of the State of Florida. Section 2. The Governor shall be elected for four years, by the qualified electors, at the time and place where they shall vote for Representatives, and shall remain in office until a successor be chosen and qualified, and shall not be eligible to re-election until the expiration of four years thereafter. Section 3. No person shall be eligible to the office of Governor unless he shall have attained the age of thirty years, shall have been a citizen of the United States ten years, or an inhabitant of Florida at the time of the adoption of this Constitution, (being a citizen of the United States,) and shall have been a resident of Florida at least five years next preceding the day of election. Section 4. The returns of every election for Governor shall be sealed up and transmitted to the seat of Government, directed to the Speaker of the House of Representatives, who shall, during the first week of the session, open and publish them in the presence of both Houses of the General Assembly, and the person having the highest number of votes, shall be Governor; but if two or more shall be equal and highest in votes, one of them shall be chosen Governor by the joint vote of the two Houses; and contested elections for Governor shall be determined by both Houses of the General Assembly, in such manner as shall be prescribed by law. Section 5. He shall, at stated times, receive a compensation for his services, which shall not be increased or diminished during the term for which he shall have been elected. Section 6. He shall be Commander-in-Chief of the Army and Navy of this State, and of the Militia thereof. Section 7. He may require information in writing from the officers of the Executive Departments, on any subject relating to the duties of their respective offices. Section 8. He may, by proclamation, on extraordinary occasions, convene the General Assembly at the seat of Government, or at a different place, if that shall have become dangerous from an enemy, or from disease; and in case of disagreement between the two Houses with respect to the time of adjournment, he may adjourn them to such time as he shall think proper, not beyond the day of the next meeting designated by this Constitution. Section 9. He shall, from time to time, give to the General Assembly information of the State of the Government, and recommend to their consideration such measures as he may deem expedient. Section 10. He shall take care that the laws be faithfully executed. Section 11. In all criminal and penal cases, (except of treason and impeachment,) after conviction, he shall have power to grant reprieves and pardons, and remit fines and forfeitures under such rules and regulations as shall be prescribed by law; and in cases of treason, he shall have power, by and with the advice and consent of the Senate, to grant reprieves and pardons; and he may, in the recess of the Senate, respite the sentence until the end of the next session of the General Assembly. Section 12. There shall be a seal of the State, which shall be kept by the Governor, and used by him officially, with such device as the Governor first elected may direct, and the present seal of the Territory shall be the seal of the State until otherwise directed by the General Assembly. Section 13. All commissions shall be in the name, and by the authority of the State of Florida, be sealed with the State seal, and signed by the Governor, and attested by the Secretary of State. Section 14. There shall be a Secretary of State appointed by joint vote of both Houses of the General Assembly, who shall continue in office during the term of four years; and he shall keep a fair register of the official acts and proceedings of the Governor, and shall, when required, lay the same and all papers, minutes, and vouchers, relative thereto, before the General Assembly, and shall perform such other duties as may be required of him by law. Section 15. Vacancies that happen in offices, the appointment to which is vested in the General Assembly, or given to the Governor, with the advice and consent of the Senate, shall be filled by the Governor during the recess of the General Assembly, by granting commissions, which shall expire at the end of the next session. Section 16. Every bill, which shall have passed both Houses of the General Assembly, shall be presented to the Governor; if he approve, he shall sign it; but if not, he shall return it with his objections to the House in which it shall have originated, who shall enter the objections at large upon the journals, and proceed to re-consider it; and if, after such re-consideration, a majority of the whole number elected to that House, shall agree to pass the bill, it shall be sent with the objections to the other House, by which it shall likewise be re-considered; and if approved by a majority of the whole number elected to that House, it shall become a law; but in such cases, the votes of both Houses shall be by yeas and nays, and the names of the members voting for, or against the bill, shall be entered on the journals of each House respectively; and if any bill shall not be returned by the Governor, within five days (Sundays excepted) after it shall have been presented to him the same shall be a law in like manner, as if he had signed it; unless the General Assembly by their adjournment, prevent its return, in which case, it shall not be a law. Section 17. Every order, resolution, or vote, to which concurrence of both Houses may be necessary, except on questions of adjournment, shall be presented to the Governor; and before it shall take effect, be approved by him, or being disapproved, be re-passed by both Houses, according to the rules and limitations prescribed in case of a bill. Section 18. In case of the impeachment of the Governor, his removal from office, death, refusal to qualify, resignation, or absence from the State, the President of the Senate shall exercise all the power and authority appertaining to the office of Governor, during the term for which the Governor was elected; unless the General Assembly shall provide by law for the election of a Governor to fill such vacancy; or, until the Governor absent, or impeached, shall return, or be acquitted. Section 19. If during the vacancy of the office of Governor, the President of the Senate shall be impeached, removed from office, refuse to qualify, resign, die, or be absent from the State, the Speaker of the House of Representatives shall in like manner, administer the Government. Section 20. The President of the Senate, or Speaker of the House of Representatives, during the time he administers the Government, shall receive the same compensation which the Governor would have received. Section 21. The Governor shall always reside, during the sessions of the General Assembly, at the place where their sessions are held, and at all other times wherever, in their opinion, the public good may require. Section 22. No person shall hold the office of Governor, and any other office or commission, civil or military, either in this State, or under any State, or the United States, or any other power, at one and the same time, except the President of the Senate, or the Speaker of the House of Representatives, when he shall hold the office, as aforesaid. Section 23. A State Treasurer, and Comptroller of Public Accounts, shall be elected by joint vote of both Houses of the General Assembly, at each regular session thereof. Section 1. The Legislative power of this State shall be vested in two distinct branches, the one to be styled the Senate, the other the House of Representatives, and both together, "The General Assembly of the State of Florida," and the style of all the laws shall be "Be it enacted by the Senate and House of Representatives of the State of Florida in General Assembly convened." Section 2. The members of the House of Representatives shall be chosen by the qualified voters, and shall serve for the term of one year from the day of the commencement of the general election and no longer, and the sessions of the General Assembly shall be annual, and commence on the fourth Monday in November in each year, or at such other time, as may be prescribed by law. Section 3. The Representatives shall be chosen every year, on the first Monday in the Month of October, until otherwise directed by law. Section 4. No person shall be a representative, unless he be a white man, a citizen of the United States, and shall have been an inhabitant of the State, two years next preceding his election, and the last year thereof a resident of the county for which he shall be chosen, and shall have attained the age of twenty-one years. Section 5. The Senators shall be chosen by the qualified electors, for the term of two years, at the same time, in the same manner, and in the same places where they vote for members of the House of Representatives; and no man shall be a Senator, unless he be a white man, a citizen of the United States, and shall have been an inhabitant of this State, two years next preceding his election, and the last year thereof, a resident of the District or County for which he shall be chosen, and shall have attained the age of twenty-five years. Section 6. The Senators after their first election, shall be divided by lot, into two classes, and the seats of the Senators of the first class, shall be vacated at the expiration of the first year, and of the second class, shall be vacated at the expiration of the second year, so that one half thereof, as near as possible, may be chosen for ever thereafter, annually, for the term of two years. Section 7. The House of Representatives, when assembled, shall choose a Speaker and its other officers, and the Senate a President and its other officers, and each House shall be judge of the qualifications, elections, and returns of its members; but a contested election shall be determined in such manner as shall be directed by law. Section 8. A majority of each House shall constitute a quorum to do business, but a smaller number may adjourn from day to day, and may compel the attendance of absent members in such manner and under such penalties as each House may prescribe. Section 9. Each House may determine the rules of its own proceedings, punish its members for disorderly behavior, and with the consent of two-thirds, expel a member, but not a second time for the same cause. Section 10. Each House, during the session, may punish by imprisonment any person, not a member, for disrespectful or disorderly behavior in its presence, or for obstructing any of its proceedings, provided such imprisonment shall not extend beyond the end of the session. Section 11. Each House shall keep a Journal of its proceedings, and cause the same to be published immediately after its adjournment, and the yeas and nays of the members of each House shall be taken and entered upon the journals upon the final passage of every bill, and may, by any two members, be required upon any other question, and any member of either House shall have liberty to dissent from or protest against any act or resolution which he may think injurious to the public or an individual, and have the reasons of his dissent entered on the journal. Section 12. Senators and Representatives shall in all cases, except treason, felony or breach of the peace, be privileged from arrest during the session of the General Assembly, and in going to or returning from the same, allowing one day for every twenty miles such member may reside from the place at which the General Assembly is convened, and for any speech or debate in either House they shall not be questioned in any other place. Section 13. The General Assembly shall make provision by law for filling vacancies that may occur in either House by the death, resignation, (or otherwise,) of any of its members. Section 14. The doors of each House shall be open, except on such occasions as, in the opinion of the House, the public safety may imperiously require secrecy. Section 15. Neither House shall, without the consent of the other, adjourn for more than three days, nor to any other place than that in which they may be sitting. Section 16. Bills may originate in either House of the General Assembly, and all bills passed by one House may be discussed, amended, or rejected by the other, but no bill shall have the force of law until on three several days it be read in each House, and free discussion be allowed thereon, unless in cases of urgency four-fifths of the House in which the same shall be depending may deem it expedient to dispense with the rule; and every bill having passed both Houses shall be signed by the Speaker and President of their respective Houses. Section 17. Each member of the General Assembly shall receive from the public Treasury such compensation for his services as may be fixed by law, but no increase of compensation shall take effect during the term for which the Representatives were elected when such law passed. Section 18. The number of members of the House of Representatives shall never exceed sixty. Section 1. The Judicial power of this State, both as to matters of law and equity, shall be vested in a Supreme Court, Courts of Chancery, Circuit Courts and Justices of the Peace, provided the General Assembly may also vest such criminal jurisdiction as may be deemed necessary in Corporation Courts, but such jurisdiction shall not extend to capital offenses. Section 2. The Supreme Court, except in cases otherwise directed in this Constitution, shall have appellate jurisdiction only, which shall be co-extensive with the State, under such restrictions and regulations, not repugnant to this Constitution, as may from time to time be prescribed by law, provided that the said Court shall always have power to issue writs of injunction, mandamus, quo warranto, habeas corpus, and such other remedial and original writs as may be necessary to give it a general superintendence and control of all other Courts. Section 3. For the term of five years from the election of the Judges of the Circuit Courts, and thereafter until the General Assembly shall otherwise provide, the powers of the Supreme Court shall be vested in, and its duties performed by the Judges of the several Circuit Courts within this State, and they, or a majority of them shall hold such sessions of the Supreme Court, and at such times as may be directed by law. Section 4. The Supreme Court, when organized, shall be holden at such times and places as may be provided by law. Section 5. The State shall be divided into at least four convenient Circuits, and until other Circuits shall be provided for by the General Assembly, the arrangement of the Circuits shall be the Western, Middle, Eastern and Southern Circuits, and for each Circuit there shall be appointed a Judge, who shall after his appointment, reside in the Circuit for which he has been appointed, and shall, at stated times, receive for his services a salary of not less than two thousand dollars per annum, which shall not be diminished during the continuance of such Judge in office; but the Judges shall receive no fees or perquisites of office, nor hold any other office of profit under the State, the United States, or of any other power. Section 6. The Circuit Courts shall have original jurisdiction in all matters, civil and criminal, within this State, not otherwise excepted in this Constitution. Section 7. A Circuit Court shall be held in such Counties, and at such times and places therein, as may be prescribed by law, and the Judges of the several Circuit Courts may hold Courts for each other, and shall do so when directed by law. Section 8. The General Assembly shall have power to establish and organize a separate Court or Courts of original equity jurisdiction; but until such Court or Courts shall be established and organized, the Circuit Courts shall exercise such jurisdiction. Section 9. The General Assembly shall provide by law for the appointment, in each County, of an officer to take probate of wills, to grant letters testamentary of administration and guardianship; to attend to the settlement of the estates of decedents and of minors, and to discharge the duties usually appertaining to Courts of Ordinary, subject to the direction and supervision of the Courts of Chancery, as may be provided by law. Section 10. A competent number of Justices of the Peace shall be, from time to time, appointed or elected in and for each County, in such mode, and for such term of office, as the General Assembly may direct; and shall possess such jurisdiction as may be prescribed by law; and in cases tried before a Justice of the Peace, the right of appeal shall be secured under such rules and regulations as may be prescribed by law. Section 11. Justices of the Supreme Court, Chancellors, and Judges of the Circuit Courts, shall be elected by the concurrent vote of a majority of both Houses of the General Assembly. Section 12. The Judges of the Circuit Courts, shall, at the first session of the General Assembly to be holden under this Constitution, be elected for the term of five years, and shall hold their offices for that term, unless sooner removed under the provisions made in this Constitution for removal of Judges by address or impeachment; and at the expiration of five years, the Justices of the Supreme Court and the Judges of the Circuit Courts, shall be elected for the term of and during their good behavior; and for wilful neglect of duty, or other reasonable cause, which shall not be sufficient ground for impeachment, the Governor shall remove any of them, on the address of two-thirds of each House of the General Assembly; provided, however, that the cause or causes shall be stated at length in such address, and entered on the journals of each House; and provided further, that the cause or causes shall be notified to the Judge so intended to be removed, and he shall be admitted to a hearing in his own defense, before any vote for such address shall pass; and in such cases, the vote shall be taken by yeas and nays, and entered on the journals of each House respectively. Section 13. The Clerk of the Supreme Court and the Clerks of the Courts of Chancery, shall be elected by the General Assembly; and the Clerks of the Circuit Courts shall be elected by the qualified electors, in such mode as may be prescribed by law. Section 14. The Justices of the Supreme Court, Chancellors, and Judges of the Circuit Courts, shall, by virtue of their offices, be conservators of the peace throughout the State; and Justices of the Peace in their respective Counties. Section 15. The style of all process shall be "the State of Florida," and all criminal prosecutions shall be carried on in the name of the State of Florida, and all indictments shall conclude, "against the peace and dignity of the same." Section 16. There shall be an Attorney General for the State, who shall reside at the Seat of Government. It shall be his duty to attend all sessions of the General Assembly, and upon the passage of any act, to draft and submit to the General Assembly, at the same session, all necessary forms of proceedings under such laws, which, when approved, shall be published therewith, and he shall perform such other duties at may be prescribed by law. He shall be elected by joint vote of the two Houses of the General Assembly, and shall hold his office for four years; but may be removed by the Governor, on the address of two-thirds of the two Houses of the General Assembly, and shall receive for his services a compensation to be fixed by law. Section 17. There shall be one Solicitor for each Circuit, who shall reside therein, to be elected by the joint vote of the General Assembly, who shall hold his office for the term of four years; and shall receive for his services a compensation to be fixed by law. Section 18. No Justice of the Supreme Court shall sit as Judge or take part in the Appellate Court on the trial or hearing of any case which shall have been decided by him in the Court below. Section 19. The General Assembly shall have power to establish in each County, a Board of Commissioners for the regulation of the County business therein. Section 20. No duty not Judicial shall be imposed by law upon the Justices of the Supreme Court, Chancellors, or the Judges of the Circuit Courts of this State. Section 1. Every free white male person of the age of twenty-one years and upwards, and who shall be at the time of offering to vote a citizen of the United States; and who shall have resided, and had his habitation, domicil, home, and place of permanent abode in Florida for two years next preceding the election at which he shall offer to vote; and who shall have at such time, and for six months immediately preceding said time, shall have had his habitation, domicil, home, and place of permanent abode in the County in which he may offer to vote, and who shall be enrolled in the Militia thereof, (unless by law exempted from serving in the Militia,) shall be deemed a qualified elector at all elections under this Constitution, and none others; except in elections by general ticket in the State or District prescribed by law, in which cases the elector must have been a resident of the State two years next preceding the election, and six months within the election district in which he offers to vote: provided that no soldier, seaman, or marine in the regular Army or Navy of the United States, unless he be a qualified elector of the State previous to his enlistment as such soldier, seaman, or marine in the regular Army or Navy of the United States or of the Revenue Service, shall be considered a resident of the State, in consequence of being stationed within the same. Section 2. The General Assembly shall, at its first session, provide, for the registration of all the qualified electors in each county; and thereafter from time to time, of all who may become such qualified electors. Section 3. No President, Director, Cashier, or other officer of any Banking company in this state, shall be eligible to the office of Governor, Senator or Representative to the General Assembly of this State, so long as he shall be such President, Director, Cashier, or other officer, nor until the lapse of twelve months from the time at which he shall have ceased to be such President, Director, Cashier, or other officer. Section 4. The General Assembly shall have power to exclude from every office of honor, trust or profit, within the State, and from the right of suffrage, all persons convicted of bribery, perjury, or other infamous crime. Section 5. No person shall be capable of holding, or of being elected to any post of honor, profit, trust, or emolument, civil or military, legislative, executive, or judicial, under the government of this State, who shall hereafter fight a duel, or send, or accept a challenge to fight a duel, the probable issue of which may be the death of the challenger, or challenged, or who shall be a second to either party, or who shall in any manner aid, or assist in such duel, or shall be knowingly the bearer of such challenge, or acceptance, whether the same occur, or be committed in or out of the State. Section 6. No person who may hereafter be a collector, or holder of public moneys, shall have a seat in either House of the General Assembly, or be eligible to any office of trust, or profit, under this State, until he shall have accounted for, and paid into the Treasury, all sums for which he may be accountable. Section 7. No Governor, Member of Congress, or of the General Assembly of this State, shall receive a fee, be engaged as counsel, agent, or attorney, in any civil case, or claim, against this State, or to which this State shall be a party, during the time he shall remain in office. Section 8. No Governor, Justice of the Supreme Court, Chancellor or Judge of this State, shall be eligible to election, or post of honor, or emolument, under this State, or to the station of Senator, or Representative in Congress of the United States, from this State, until one year after he shall have ceased to be such Governor, Justice, Chancellor, or Judge. Section 9. No Senator or Representative shall, during the term for which he shall have been elected, be appointed to any civil office of profit, under this State which shall have been created, or the emoluments of which shall have been increased, during such term, except such offices as may be filled by elections by the people. Section 10. No minister of the Gospel shall be eligible to the office of Governor, Senator, or member of the House of Representatives of this State. Section 11. Members of the General Assembly, and all officers, Civil or Military, before they enter upon the execution of their respective offices, shall take the following oath or affirmation: I do swear (or affirm,) that I am duly qualified, according to the Constitution of this State, to exercise the office to which I have been elected, (or appointed) and will, to the best of my abilities, discharge the duties thereof, and preserve, protect, and defend the Constitution of this State, and of the United States. Section 12. Every person shall be disqualified from serving as Governor, Senator, Representative, or from holding any other office of honor, or profit in this State, for the term for which he shall have been elected, who shall have been convicted of having given or offered any bribe to procure his election. Section 13. Laws shall be made by the General Assembly, to exclude from office, and from suffrage, those who shall have been or may thereafter be convicted of bribery, perjury, forgery, or other high crime, or misdemeanor; and the privilege of suffrage shall be supported by laws regulating elections, and prohibiting, under adequate penalties, all undue influence thereon, from power, bribery, tumult, or other improper practices. Section 14. All civil officers of the State at large, shall reside within the State, and all District or county officers within their respective Districts, or counties, and shall keep their respective offices at such places therein as may be required by law. Section 15. It shall be the duty of the General Assembly to regulate by law, in what cases, and what deduction from the salaries of public officers, shall be made, for neglect of duty in their official capacity. Section 16. Returns of elections for members of Congress, and the General Assembly, shall be made to the Secretary of State, in manner to be prescribed by law. Section 17. In all elections by the General Assembly, the vote shall be viva voce, and in all elections by the people, the vote shall be by ballot. Section 18. No member of Congress, or person holding or exercising any office of profit under the United States, or under any foreign power shall be eligible as a member of the General Assembly of this State, or hold, or exercise any office of profit, at the same time, except the office of Justice of the Peace, notary public, constable and militia offices. Section 19. The General Assembly shall by law provide for the appointment, or election, and the removal from office, of all officers, civil, and military, in this State, not provided for in this Constitution. Section 20. The power of impeachment shall be vested in the House of Representatives. Section 21. All impeachments shall be tried by the Senate; and when sitting for that purpose, the Senators shall be upon oath, or affirmation; and no person shall be convicted, without the concurrence of two-thirds of the members present. Section 22. The Governor and all civil officers shall be liable to impeachment for any misdemeanor in office: but judgment in such cases shall not extend further than to removal from office, and disqualification to hold any office of honor, trust, or profit under this State; but the parties shall nevertheless be liable to indictment, trial, and punishment according to law. Section 1. All Militia officers shall be elected by the persons subject to military duty, within the bounds of their several companies, battalions, regiments, brigades, and divisions, under such rules and regulations as the General Assembly may, from time to time, direct and establish. Section 2. The Governor shall appoint all the officers of the executive staff, except the Adjutant General, and Paymaster General, who shall be appointed by the Governor, by, and with the advice and consent of the Senate. The majors general and brigadiers general, and commanding officers of regiments, shall appoint such staff officers as may be prescribed by law; provided, no person shall be eligible to any staff appointment, unless he hold a commission in the line. ARTICLE VIII. Taxation and Revenue. Section 1. The General Assembly shall devise and adopt a system of Revenue having regard to an equal and uniform mode of taxation, to be general throughout the State. Section 2. No other or greater amount of Tax, or Revenue, shall at any time be levied, than may be required for the necessary expenses of Government. Section 3. No money shall be drawn from the Treasury, but in consequence of an appropriation by law and a regular statement of the receipts, and the expenditures of all public moneys shall be published and promulgated annually with the laws of the General Assembly. Section 4. The General Assembly shall have power to authorize the several counties, and incorporated towns in this State, to impose taxes for county and corporation purposes, respectively, and all property shall be taxed upon the principles established in regard to State taxation. ARTICLE IX. Census and Apportionment of Representation. Section 1. The General Assembly shall, in the year one thousand eight hundred and forty-five, and every tenth year thereafter, cause an enumeration to be made of all the inhabitants of the state, and to the whole number of free white inhabitants shall be added three-fifths of the number of slaves, and they shall then proceed to apportion the representation, equally among the different counties, according to such enumeration, giving however one representative to every county, and increasing the number of Representatives on a uniform ratio of population, according to the foregoing basis, and which ratio shall not be changed until a new census shall have been taken. Section 2. The General Assembly shall also, after every such enumeration, proceed to fix by law the number of Senators which shall constitute the Senate of the State of Florida, and which shall never be less than one-fourth nor more than one-half of the whole number of the House of Representatives; and they shall lay off the State into the same number of Senatorial Districts, as nearly equal in the number of inhabitants as may be, according to the ratio of representation established in the preceding section, each of which Districts shall be entitled to one Senator. Section 3. When any Senatorial District shall be composed of two or more counties, the counties, of which such district consists, shall not be entirely separated by any county belonging to another district, and no county shall be divided in forming a district. Section 4. No new county shall be entitled to separate representation, until its population equal the ratio of representation, then existing; nor shall any county be reduced in population by division, below the existing ratio. Section 1. The proceeds of all lands that have been or may hereafter be granted by the United States for the use of Schools, and a Seminary or Seminaries, of learning, shall be and remain a perpetual fund, the interest of which, together with all monies derived from any other source applicable to the same object, shall be inviolably appropriated to the use of Schools and Seminaries of learning respectively, and to no other purpose. Section 2. The General Assembly shall take such measures as may be necessary to preserve from waste or damage all land so granted and appropriated to the purposes of Education. Section 1. It shall be the duty of the General Assembly to provide for the prevention of waste and damage of the public lands now possessed, or that may hereafter be ceded to the Territory or State of Florida, and it may pass laws for the sale of any part or portion thereof; and in such case provide for the safety, security, and appropriation of the proceeds. Section 2. A liberal system of Internal Improvements being essential to the development of the resources of the country, shall be encouraged by the Government of this State, and it shall be the duty of the General Assembly, as soon as practicable, to ascertain by law proper objects of improvement in relation to roads, canals and navigable streams, and to provide for a suitable application of such funds as may be appropriated for such improvements. Section 1. 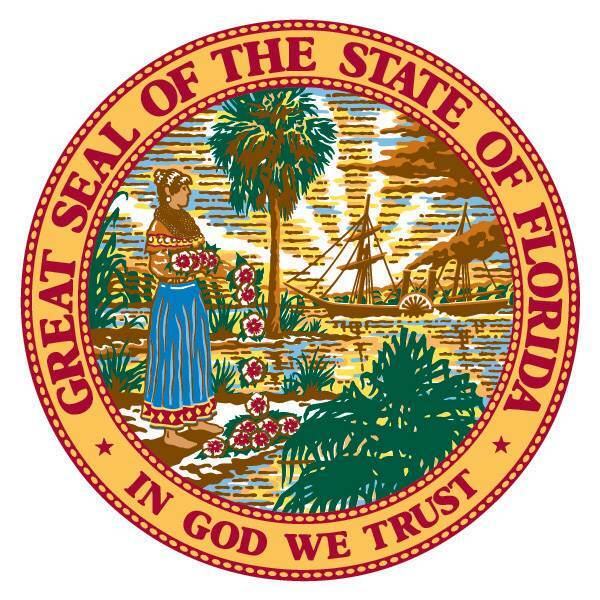 The jurisdiction of the State of Florida shall extend over the Territories of East and West Florida, which, by the Treaty of Amity, Settlement and Limits, between the United States and his Catholic Majesty, on the 22nd day of February, A. D., 1819, were ceded to the United States. ARTICLE XIII. Banks, and other Corporations. Section 1. The General Assembly shall pass a general law for the incorporation of all such churches, and religious or other societies as may accept thereof; but no special act of incorporation thereof shall be passed. Section 2. The General Assembly shall pass no act of incorporation, or make any alteration therein, unless with the assent of at least two-thirds of each House, and unless public notice in one or more newspapers in the State shall have been given for at least three months immediately preceding the session at which the same may be applied for. Section 3. No Banking corporation shall be created or continue which is composed of a less number than twenty individuals, a majority of whom at least, shall be residents of the State; and no other corporation shall be created or continue composed of a less number than ten, of whom at least five shall be residents of this State. Section 4. No Bank Charter, or any act of incorporation granting exclusive privileges, shall be granted for a longer period than twenty years, and no Bank Charter shall ever be extended or renewed. Section 5. The Charters of Banks granted by the General Assembly shall restrict such Banks to the business of exchange, discount and deposit, and they shall not speculate or deal in real estate or the stock of other corporations or associations, or in merchandise or chattels, or be concerned in insurance, manufacturing, exportation or importation, except of bullion or specie; shall not act as Trustee in anywise; nor shall they own real estate or chattels, except such as shall be necessary for their actual use in the transaction of business, or which may be pledged as further security, or received towards, or in satisfaction of previously contracted debts, or purchased at legal sales, to satisfy such debts, of which they shall be required to make sale within two years after the acquisition thereof. Section 6. The capital stock of any Bank shall not be less than one hundred thousand dollars, and shall be created only by the actual payment of specie therein, and no Bank shall borrow money to create or add to its capital, or to conduct its business, and no loans shall be made on stock. Section 7. All liabilities of such Banks shall be payable in specie, and the aggregate of the liabilities and issues of a Bank shall at no time exceed double the amount of its capital stock paid in. Section 8. No Bank shall make a note or security of any kind for a smaller sum than five dollars, and the General Assembly may increase such restriction to twenty dollars. Section 9. No dividends of profits exceeding ten per centum per annum on the capital stock paid in shall be made, but all profits over ten per centum per annum shall be set apart and retained as a safety fund. Section 10. Stockholders in a bank, when an act of forfeiture of its Charter is committed, or when it is dissolved or expires, shall be individually and severally liable for the payment of all its debt, in proportion to the stock owned by each. Section 11. Banks shall be open to inspection under such regulations as may be prescribed by law, and it shall be the duty of the Governor to appoint a person or persons, not connected in any manner with any Bank in the State, to examine at least once a year into their state and condition, and the officers of every Bank shall make quarterly returns to the Governor of its state and condition, and the names of the stockholders, and shares held by each. Section 12. Non user for the space of one year, or any act of a corporation, or those having the control and management thereof, or intrusted therewith inconsistent with or in violation of the provisions of this Constitution or of its charters, shall cause its forfeiture, and the General Assembly shall, by general law provide a summary process for the sequestration of its effects and assets, the appointment of officers to settle its affairs, and no forfeited charter shall be restored. The foregoing provision shall not be construed to prevent the General Assembly from imposing other restrictions and provisions in the creation of corporations. Section 13. The General Assembly shall not pledge the faith and credit of the State, to raise funds in aid of any corporation whatsoever. Section 14. The General Assembly shall at its first session, have power to regulate, restrain and control, all associations claiming to exercise corporate privileges in the State, so as to guard, protect, and secure the interests of the people of the State, not violating vested rights, or impairing the obligation of contracts. ARTICLE XIV. Amendments and Revision of the Constitution. Section 1. No Convention of the people shall be called, unless by the concurrence of two-thirds of each House of the General Assembly. Section 2. No part of this Constitution shall be altered; unless a bill to alter the same, shall have been read three times in the House of Representatives, and three times in the Senate, and agreed to by two-thirds of each House of the General Assembly; neither shall any alteration take place until the bill so agreed to, be published six months previous to a new election for members to the House of Representatives; and if the alteration proposed by the General Assembly shall be agreed to at their first session by two-thirds of each House of the General Assembly, after the same shall have been read three times on three several days in each House, then and not otherwise, the same shall become a part of the Constitution. ARTICLE XV. The Seat of Government. Section 1. The Seat of Government, of the State of Florida, shall be and remain permanent at the city of Tallahassee, for the term and time of five years, from and after the end of the first session of the General Assembly, to be holden under this Constitution; and after the expiration of the said five years, the General Assembly shall have power to remove the Seat of Government, from Tallahassee, and fix the same at any other point; Provided, that the General Assembly shall immediately after the expiration of ten years, from the end of the said first session thereof, fix permanently the Seat of Government. Section 1. The General Assembly shall have no power to pass laws for the emancipation of slaves. Section 2. They shall have no power to prevent emigrants to this State, from bringing with them, such persons as may be deemed slaves, by the laws of any one of the United States: Provided, they shall have power to enact laws to prevent the introduction of any slaves who may have committed crimes in other States. Section 3. The General Assembly shall have power to pass laws to prevent free negroes, mulattoes, and other persons of color, from emigrating to this State, or from being discharged from on board any vessel, in any of the ports of Florida. Section 4. Treason against the State shall consist only in levying war against it, or in adhering to its enemies, giving them aid and comfort. No person shall be convicted of treason, unless on the testimony of two witnesses to the same overt act, or his confession in open court. Section 5. Divorces from the bonds of matrimony shall not be allowed, but by the judgment of a court, as shall be prescribed by law. Section 6. The General Assembly shall declare by law, what parts of the common law, and what parts of the civil law, not inconsistent with this Constitution, shall be in force in this State. Section 7. The oaths of officers directed to be taken under this Constitution, may be administered by any judge, or justice of the peace, of the Territory, or State of Florida until otherwise prescribed by law. Section 1. That all laws and parts of laws, now in force, or which may be hereafter passed by the Governor and Legislative Council, of the Territory of Florida, not repugnant to the provisions of this Constitution, shall continue in force, until by operation of their provisions or limitations, the same shall cease to be in force, or until the General Assembly of this State shall alter or repeal the same; and all writs, actions, prosecutions, judgments, and contracts, shall be, and continue unimpaired, and all process which has heretofore issued, or which may be issued, prior to the last day of the first session of the General Assembly of this State, shall be as valid as if issued in the name of the State; and nothing in this Constitution shall impair the obligation of contracts, or violate vested rights, either of individuals or of associations, claiming to exercise corporate privileges in this State. Section 2. All fines, penalties, forfeitures, obligations, and escheats, accruing to the Territory of Florida, shall accrue to the use of the State of Florida. Section 3. All recognizances heretofore taken, or which may be taken before the organization of the Judicial Department under this Constitution, shall remain valid, and shall pass over to, and may be prosecuted in the name of the State; and all bonds, executed to the Governor of the Territory of Florida, or to any other officer in his official capacity, shall pass over to the Governor or other proper State authority, and to their successors in office for the uses therein respectively expressed, and may be sued for, and recovered accordingly; and all criminal prosecutions and penal actions, which have arisen, or which may arise before the organization of the Judicial Department under this Constitution, and which shall then be depending, may be prosecuted to judgment and execution in the name of the State. Section 4. All officers, civil and military, now holding their offices and appointments in the Territory, under the authority of the United States, or under the authority of the Territory, shall continue to hold and exercise their respective offices and appointments until superseded under this constitution; and all actions at law, or suits in chancery, or any proceeding pending, or which may be pending, in any Court of the Territory of Florida, may be commenced in or transferred to such Court of the State as may have jurisdiction of the subject-matter thereof. Section 5. This Constitution shall be submitted to the people for ratification at the election for Delegate on the first Monday of May next. Each qualified voter shall express his assent or dissent to the Constitution by directing the managers of said election to write opposite to his name on the poll-book, either the word "Constitution," or "No Constitution." And in case the time of election for Delegate be changed to any other day, than the first Monday of May next, then the Judges or Clerks of the County Courts respectively, shall appoint managers to hold an election on the said first Monday of May, for ratification of the Constitution, and said managers shall conduct said election in the manner provided by the laws of the Territory respecting elections, and make return of the result of such vote forthwith, by depositing the original poll-book in the Clerk's Office of their Counties respectively, and by transmitting a certificate of the result to the President of the Convention, who shall forthwith make Proclamation of the same; and in case the Constitution be ratified by the People, and immediately after official information shall have been received that Congress have approved the Constitution, and provided for the admission of Florida, the President of this Convention shall issue writs of election to the proper officers in the different Counties, enjoining them to cause an election to be held for Governor, Representative in Congress, and Members of the General Assembly in each of their respective Counties. The election shall be held on the first Monday after the lapse of sixty days following the day of the date of the President's proclamation, and shall take place on the same day throughout the State. The said election shall be conducted according to the then existing election laws of the Territory of Florida: Provided, however that in case of the absence or disability of the President of the Convention, to cause the said election to be carried into effect, the Secretary of this Convention shall discharge the duties hereby imposed upon the President; and in case of the absence or disability of the Secretary, a committee consisting of five, to wit: Leigh Read, George T. Ward, James D. Westcott, Jr., Thomas Brown, and Leslie A. Thompson, or a majority of them, shall discharge the duties herein imposed on the Secretary of the Convention, and, the Members of the General Assembly, so elected, shall assemble on the fourth Monday thereafter, at the Seat of Government. The Governor, Representative in Congress, and Members of the General Assembly, shall enter upon the duties of their respective offices immediately after their election, under the provisions of this Constitution, and shall continue in office in the same manner, and during the same period, they would have done, had they been elected on the first Monday in October. Section 6. The General Assembly shall have power by the votes of two-thirds of both Houses to accede to such propositions as may be made by the Congress of the United States, upon the admission of the State of Florida into the National confederacy and Union, if they shall be deemed reasonable and just, and to make declaration of such assent by law; and such declaration when made shall be binding upon the people and the State of Florida as a compact; and the Governor of the State of Florida, shall notify the President of the United States of the Acts of the General Assembly relating thereto; and in case of declining to accede to such propositions or any part thereof, the General Assembly shall instruct the Senators and Representative of the State of Florida in Congress, to procure such modification or alteration thereof as may be deemed reasonable and just, and assent thereto, subject to the ratification of the General Assembly by law as aforesaid. Section 7. The Courts of this State shall never entertain jurisdiction of any grants of land, in the Floridas, made by the King of Spain, or by his authority, subsequent to the twenty-fourth day of January, eighteen hundred and eighteen, nor shall the said Courts receive as evidence, in any case, certain grants said to have been made by the said King of Spain, in favor of the Duke of Alagon, the Count Punon Rostro, and Don Pedro de Vargas, or any title derived from either of said Grants, unless with the express assent of the Congress of the United States. Done in Convention, held in pursuance of an act of the Governor and Legislative Council of the Territory of Florida, entitled, "An Act to call a Convention for the purpose of organizing a State Government," passed 30th day of January, 1838, and appro ved 2nd February, eighteen hundred and thirty-eight. March 3rd 1845, Florida becomes a State. Biographical / Historical: Pursuant to an Act of the Legislature approved November 30, 1860, Governor Madison S. Perry issued a proclamation calling an election on Saturday, December 22, 1860, for delegates to a Convention to address the issue of whether Florida had a right to withdraw from the Union. The Secession Convention met on January 3, 1861 in Tallahassee. John C. McGehee of Madison County was elected President. The Convention passed the Ordinance of Secession on January 10, 1861, declaring Florida to be "a sovereign and independent nation." The Convention ratified the Constitution adopted by the Confederate States of America on April 13 and adjourned sine die on April 27, 1861 unless convened by the president on or before December 25. Since the Convention generally approved of Governor Perry's actions it made no move to interfere with his administration; however, when Governor Milton took office in October of 1861 and reversed some policies of his predecessor, a move was started to reconvene the Convention. President McGehee issued a proclamation on December 13 for the convention to meet on January 14, 1862, at Tallahassee. McGehee expressed concern over two matters: the state's finances and the powers of the Governor during wartime. To remedy the later, the members appointed an Executive Council of four men to share the executive authority because they felt that the powers of a wartime executive should not be placed in the hands of one man. The Convention adjourned sine die on January 27, 1862. The series contains a one page handwritten copy of the Ordinance of Secession passed on January 10, 1861 by the members of the Florida Convention of the People (commonly referred to as the Secession Convention). Published in: Journal of the proceedings of the Convention of the People of Florida, begun and held at the Capitol in the city of Tallahassee, on Thursday, January 3, A.D. 1861. Tallahassee : Office of the Floridian and Journal, 1861. *William S. Harris may have written “of Jacksonville” after his name, not Joseph A. Collier, who was from Jackson County. *Tift’s signature looks like “Taft” on the Ordinance, but he is listed as Asa F. Tift on the 1860 Census and in the 1863 Journal of the House of Representatives. Biographical / Historical: On October 10, 1865, the Constitutional Convention met in Tallahassee to nullify the Ordinance of Secession of 1861 and adopt a new constitution for the State of Florida. The new constitution went into effect on November 7, 1865, without being submitted to the people for ratification. The Constitution of 1865 was never fully effective. Federal military forces remained in command of the state until July, 1868, when a new constitution was written. The series contains the 1865 Constitution for the State of Florida adopted by the members of the Constitutional Convention in 1865. The 67-page document is handwritten. There are no proceedings to the 1865 Constitutional Convention in the Archives. Biographical / Historical: Florida became subject to the military authority of the federal government in 1867. Pursuant to an Act of Congress, General John Pope, Commander of the 3rd Military District, issued an order on April 8, 1867, dividing the 39 counties of the State into 19 districts for the election of delegates to a convention to frame a new State Constitution. The Constitution had to conform with the Federal Constitution and with the 13th and 14th Amendments. The Convention met in Tallahassee on January 20, 1868. As the Convention began its functions, bitter factions were formed, and only under after federal government intervention was the Convention brought under control. The Convention reconvened on February 18, 1868, and Horatio Jenkins, Jr. was elected President. The Constitution was adopted by the people of Florida in May, 1868. It conferred electoral franchise upon "male persons" instead of "white male persons" as by the 1865 Constitution. With its acceptance by the federal military authorities, the State of Florida was recognized as being restored to the Union, and its Senators and Representatives were admitted to Congress. Description: The series contains the 1868 Constitution for the State of Florida drafted by the members of the Constitutional Convention in 1868. The 33-page document is handwritten. There are no proceedings to the 1868 Constitutional Convention in the Archives. Publication Note: Published in: The Acts and Resolutions Adopted by the Legislature of Florida at its First Session (1868) Under the Constitution of A.D. 1868. Tallahassee : Hiram Potter, 1868. Thus ends the Union occupation of Florida’s government. The terms of Florida’s conditional sub license remain unchanged and in full force. Biographical / Historical: The 1885 Legislature enacted Chapter 3577 calling for a Constitutional Convention in order to revise the Constitution of 1868. In May, 1885 a general election for the selection of delegates was held throughout the state. The Convention met in Tallahassee from June 9 to August 3, 1885. Samuel Pasco of Jefferson County presided. Pursuant to Ordinance No. 1 of the Convention, the Constitution was submitted to the citizens of Florida for ratification in November of 1886. The 1885 Constitution was ratified by a 31,803 to 21,243 vote. Description: The series contains the 1885 Constitution for the State of Florida drafted by the Constitutional Convention in 1885. The 57-page document is handwritten. The related minutes of the proceedings of the Constitutional Convention are located in Series 1049. The new constitution legitimized poll taxes as prerequisites for voting, thus contributing to the disenfranchisement of blacks. Publication Note: Compiled general laws of Florida 1927 : vol. 5 miscellaneous / compiled and annotated by Harry B. Skillman. Atlanta : Harrison Co., 1928.